ATS Engineers, Inspectors & Surveyors (ATS) is pleased to introduce our new Business Services Coordinator. Seth Wood recently moved to this area after obtaining a Bachelor’s Degree in English from Texas Tech University. He will be working with our Inspections department coordinating FHA and Contractor Draw inspections and reports. 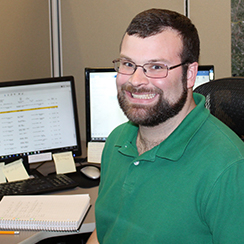 When not at work, Seth is an avid reader and loves to travel. We are excited to welcome Seth to ATS. ← ATS partners with Bigelow Homes and Homes For Hope.